Luxury Hotels in Cornwall UK and Country Houses. From 4 star hotels overlooked by a Castle to centuries old Country Houses with a log fire blazing in Winter and delightful cuisine, to a luxury hotel near Eden Project or with sea views. From summer holidays break to romantic weekend breaks Cornwall to late availability hotels. Child friendly to dogs allowed. Here are a nice selection. Hotel in Cornwall. 2*,3*,4*, 2 star hotel. 3 star hotel. 4 star hotel. Last minute weekend breaks availability. Fowey Hall A luxury hotel in Cornwall sitting in a spectacular location overlooking the sailing and fishing port of Fowey on the South Cornish coast, within its original walled gardens and with commanding views of the river estuary and far out to sea. Within easy reach of the many superb attractions in Cornwall including The Eden Project and the Lost Gardens of Heligan Fowey Hall is all about relaxation and our aim is to make you feel as relaxed as you would be at home. While catering for the children, we never forget that the adults need time too. Pets Welcome. Why not bring your pooch with you! The Royal Duchy Hotel Falmouth A warm welcome to Falmouth's finest hotel, firmly established as Falmouth's premier and only 4 star hotel. The Royal Duchy is situated in a prime sea front location with dramatic views across the bay. Lostwithiel Golf and Country Club an hotel and country club of great charm and character. We offer outstanding comfort and service - idyllically set amongst 150 acres of rolling wooded hills which look down onto the beautiful and tranquil valley of the River Fowey. Golfing Tuition, fishing from our own Lakes, and Leisure Breaks available. Ideal for Eden Project visits. Eden Project Hotel Boscundle Manor is an idyllic small luxury country house hotel situated in an ‘oasis’ of it’s own just 5 minutes from the Eden Project via a relatively traffic free route. The hotel gardens provide a wonderfully tranquil setting to stroll and relax and are home to a croquet lawn, lovely outdoor heated pool, indoor heated swimming pool and sun terraces. 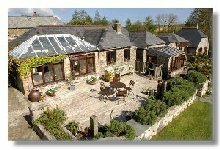 Bed & Breakfast Nr Boscastle North Cornish Coast The Old Rectory offers quality Bed & Breakfast in a historic house. The house is surrounded by 3 acres of mature south facing gardens. Thomas Hardy, the great novelist and poet, stayed at the Old Rectory in the 1870s. Lanteglos Country House Hotel Lanteglos is undoubtedly special - a little piece of heaven in beautiful North Cornwall. From the moment that you arrive through the leafy entrance,....ideally situated to allow you to enjoy all that North Cornwall offers. Mullion Cove Hotel. Situated in a spectacular cliff top position overlooking Mullion Cove and its historical ‘story book’ harbour, Mullion Cove Hotel is a wonderful hotel to relax and explore this magical corner of South Cornwall. Under new ownership, Mullion Cove Hotel has a great reputation, excellent food and warm friendly staff. The Pier House Hotel in St Austell, Cornwall is situated on the picturesque harbour of Charlestown with stunning views of the port and coastline of St Austell bay. Charlestown is a Georgian port remaining relatively unspoilt and undeveloped reflecting how many West Country ports and fishing coves looked prior to development being one of the finest late 18th and early 19th century industrial harbour sites in the country. Lower Barn is an award winning boutique guest house in the heart of the Cornish countryside, yet close to the sea, where you will enjoy being thoroughly spoilt. We offer relaxing breaks with sumptuous rooms, great food, holistic therapies which rival many more famous establishments, due to our personal touch! Simply the best bed and breakfast in Cornwall - 2006-2007 Cornwall Tourism Awards.